The Nike Air Jordan 6 “Maroon” is set to finally return this Holiday 2015 to be part of a big lineup from Jordan Brand. The shoe was originally released back in 1991, and has yet to see a retro release until now. Dressed in an Off White and Maroon color scheme. 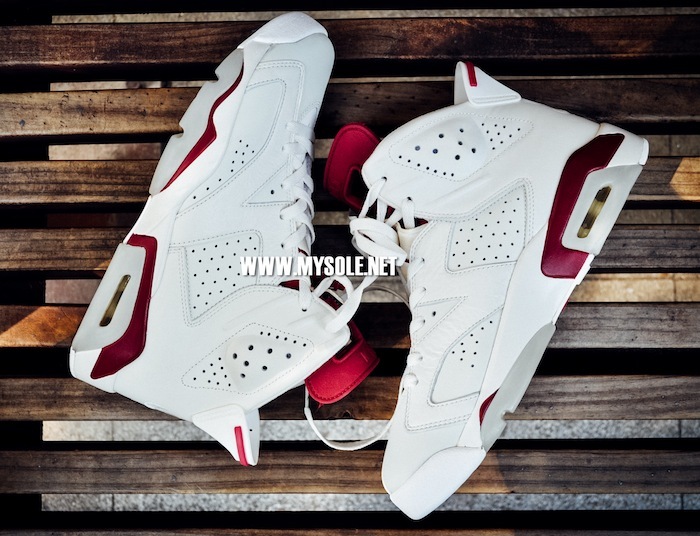 The classic Air Jordan 6 features a White leather upper with Maroon accents and a clear outsole. Perforations add for ventilation that is seen throughout the shoe’s upper. Other details that will be included in this retro release are the original lace locks that has a Jumpman logo on the top and ‘NIKE’ on the bottom, as well as OG ‘NIKE AIR’ branding on the insole and back heel. Check out the detailed and on-feet photos of the Air Jordan 6 Retro “Maroon” below and look for them to release on Saturday, December 5th to select Jordan Brand retailers, they’ll also be available in full family sizing. The retail price tag is set at premium $220 USD. It’s been a few years now of hearing rumors of these releasing and now we’ll all finally get our wish. Who’s looking forward to the return of the Air Jordan 6 “Maroon” in original form? UPDATE: The Air Jordan 6 “Maroon” with Nike Air branding is back and ready for its launch tomorrow, December 5th at select Jordan Brand shops like Kicks USA. Let us know who’s copping or passing in the comments section. UPDATE: Nike has released official images of the Air Jordan 6 “Maroon” that will debut on Saturday, December 5th. UPDATE: The Nike Air Jordan 6 “Maroon” debuts this weekend, December 5th and will be available for the entire family. Check out the complete set via Project Blitz and let us know if these are a must-cop on Saturday in the comments section. UPDATE: The Air Jordan 6 “Maroon” will be finally returning this weekend on December 5th with the beloved ‘Nike Air’ branding on the back heel. Check out the latest images below and look for them to be available at select Jordan Brand like Rock City Kicks. UPDATE: Here are a few detailed images of the Nike Air Jordan 6 OG “Maroon” that will be debuting on December 5th at shops like Shoe Palace. UPDATE: Before the Air Jordan 6 OG “Maroon” debuts on December 5th, you can find them available a few weeks early via eBay. UPDATE: Check out the latest on-feet images via MySole of the highly anticipated Air Jordan 6 “Maroon” that comes with the OG “Nike Air” branding.